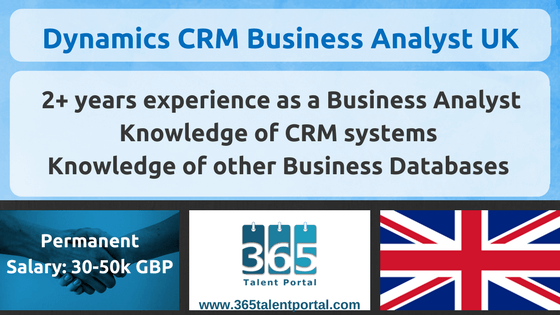 We are looking for a candidate to fill the Microsoft Dynamics CRM Business Analyst UK position in West Yorkshire. Based in Yorkshire, UK, here is a unique opportunity to specialise in delivering Microsoft Dynamics 365 projects to small businesses. You will be consulting with business owners and their teams to gather detailed requirements on their processes sufficient to configure Microsoft Dynamics 365 and update their processes as required. Capture and document user requirements in detailed functional specifications and translate those requirements into project deliverables. Play a key role in the estimation process to cost and plan projects or proposals. Provide guidance and support as necessary to technical groups internally. Provide user training on Microsoft platforms, and solutions delivered on these platforms. Produce and deliver internal and customer project documentation. Execute testing as required through the project delivery process. Lead triage of customer support issues. Oversee the migration of data. Establish working relationships with project stakeholders quickly, and delivery of consensus within broad, cross-functional teams.